had passed away at the age of 94. 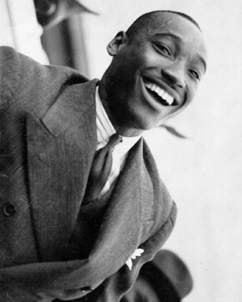 Frankie was one of the original Lindy Hoppers in the Savoy Ballroom and a member of a group that called Whitey’s Lindy Hoppers. He can be seen in many films, including A Day at the Races, and Hellzapopin. After taking a long break from dancing, he hit the floor again in the 80’s and began spreading his passion for the dance. He toured the world teaching, choreographing, telling stories, and spreading his love of life Lindy. even took me to a 2 week camp in Sweeden. I’ve been lucky enough to see him in person a few times and he has been a constant symbol of joy, life and general kick-buttedness. I don’t get many chances to dance socially these days, but when I do, it always feels like home. Frankie passed away April 27th, and I was not scheduled to be back in NYC for another few weeks. So, I had to miss the funeral service. However, I was able to attend (with my friend and fellow long time Lindy Hopper, Jen Brooks) the Memorial Service that was held as a part of Frankie’s 95 Birthday Celebration. I know that my words can not do the service justice. 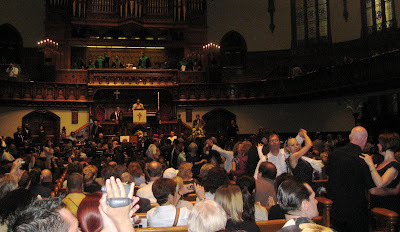 It was a perfect memorial filled with stories, laughter, gratitude, music and of course dance. After the service at 5th Ave Presbyterian, we followed Dave Otswalds Gully Low Jazz Band in a traditional New Orleans Style 2nd Line procession that ended with a dance at the Bandshell in Central Park. I felt so proud to be a part of the GIGANTIC group holding parasols, scarves and pictures of Frankie through the streets of NYC. Jen and stayed and danced in the park for a bit, and then went to another dance at the Hammerstein Ballroom. It was a great day. As I said, I don’t get a chance to dance much now…. but I can’t deny that the years I spent social dancing have shaped all that I am and all that I do now. I often seek to fill my life with joy, improvisation and general kookiness. I know the days I spent swinging out for hours on end lit a light in my heart that will never go out. Thank you, Frankie, for all of the joy you’ve spread. I, for one, will do my best to continue to spread it with your smile in my heart. Jenn Salvadori and I camping it up at Dinsey. While I’m sure I have amazing black mail videos of Jenn when she first started dancing, she and her man Justin Zillman are my favorite dancers to watch. Find them and get them to a dance floor near you! AND.. watch them here… ridic! 1996 – My first dance partner Shesha Marvin.-If you are in Southern California, check him out for lessons. At one point, even both Pastors started dancing on the Alter! This was a perfect Memorial Service. Dancing with Jen in the Park. 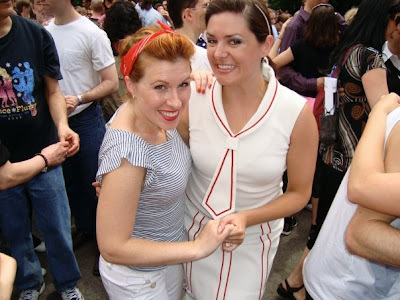 We’ve worked together at Ellen’s Stardust Diner, and FREAKED when we discovered we both Lindy Hopped. I’m so lucky I have an NYC friend who dances. Dancing with Cody Mui at the Ballroom after the Memorial Service. Thanks for sharing a wonderful memory of an obviously very influential person. Great post – I wish I could dance like that!